With safety being a top priority in today’s workforce, Arrow Uniform has developed a “One Stop Shop” for all of your Protective Apparel needs. Whether you’re looking for “HI Visibility, Enhanced Visibility or Flame Resistant clothing we literally have you covered. Arrow Uniform recognizes the importance of doing your job to the best of your ability and in the safest manner this is why we only sell, rent and lease clothing from the most respected manufacturers and provide constant feedback as garment technology improves. You’ll find exceptional men and women’s outdoor clothing, such as jackets, pants, coveralls, shirts, vests, and layering garments. All from top brands such as Bulwark, Wrangler and Carhartt FR., ana industry leaders in all types of fire resistant clothing. Check back often as we are constantly expanding our online product selection by adding new specials and other ways to save and protect your workforce. 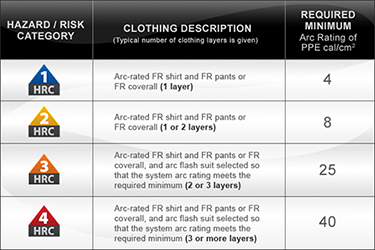 Arrow Uniform offers the widest selection of garments with enhanced visibility striping as well as “ANSI” approved garments in both FR and non FR. We offer a variety of stock garments with protective striping however if we don’t have what you’re looking for, we can customize a garment around your safety requirements. While others have all their eggs in one basket, Arrow Uniform has partnered with some of the best manufacturers and distributors in the world when it comes to “Protective Apparel”. Our variety of products allows us to build a program in the best interest of your needs. Arrow Uniform is unique in the fact we can offer you a program that combines, rental, lease or direct purchase programs. While others try to push what’s best for them, we approach your needs in a “consultative manner” using a variety of methods to protect you and your pocket book! Arrow Uniform offers a variety of products that comply with FR standards in both “Enhanced Visibility” and “Hi Visibility”. Learn more about “Hi Visibility” in our industry association Section and visiting the “ANSI” website. Click here to view the reflective striping options. Arrow is the leader in Enhanced and Hi-Vis apparel. Talk to a specialist today! Arrow is the leader in protective apparel, including Flame Resistant and Hi-Vis apparel. When it comes to compliance, Arrow Uniform is your one stop shop for your protective apparel needs. Whether you’re looking for protection from Oil and Gas, Electric Utilities or compliance with NFPA 70E/2112, we offer over 28 style in 18 colors to help protect your team. To learn more, click here to view the full catalog. You won’t find anyone with more experience with NFPA 70E and manufacturing. Arrow Uniform currently protects some of the largest manufacturers in the country and can help put a cost effective program in place for you, call an experienced FR Representative Today! Arrow Uniform offers a full variety of garments that comply with the standards of the “Electric Utility” industry. Arrow Uniform offers a full variety of garments that comply with the standards of the “Oil and Gas” industry. We offer garments for full rental in each category as well as supplemental garments such as t-shirts, sweatshirts and fleeces. workers are routinely exposed to the hazards of low visibility while on the job. To learn more, click here to read more. Here, you will find a variety of our current products within the hi-visibility category. Pricing is included. Click on an image below to go directly to one of our partners’ site. Click on an image below to go directly to an industry association.